Our neighbour’s flower peeking through the fence to say Hello! 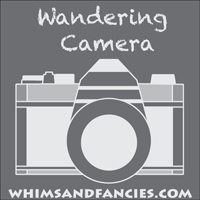 When I saw the announcement for the Flag On A Stick blog hop, I teeter-tottered on the decision of joining. As I was sorting through things and putting stuff up in my new workroom, I came across a drawing I did for a college project few years ago. The objective was to describe yourself on a shield. 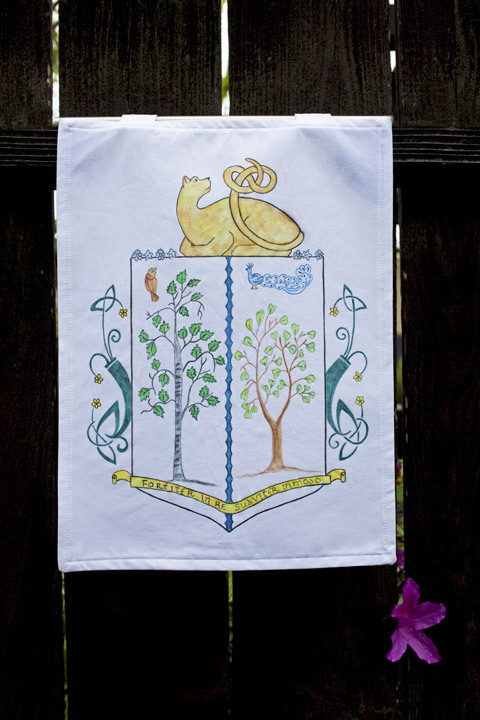 I thought that would make a perfect pennant to hang in my new atelier, as my husband lovingly calls my new workroom. So I ended up joining the Flag On A Stick blog hop hosted by Sew We Quilt. It’s an indoor flag, so I used a very light interfacing to give it a little stability and sewed two tabs to the top so it can be hung on a wall. I took the picture outside just in time before the rain started pelting down. This is the original painting that I scanned. It is done in watercolour pencils and marker. The scan wasn’t quite large enough for this project, so I scaled it up and printed it out. I then traced the drawing on the fabric in pencil and painted with acrylic colour pencils, paintbrush and textile medium. I haven’t done textile painting in a very, very long time and I couldn’t find any reference on how to go about it when using pencils. So I did a few test doodles to figure out what method works best for fabric painting. The flag is steeped in symbolism. Every single colour and element in the flag has some meaning that describes me, but I won’t bore you with all the details. 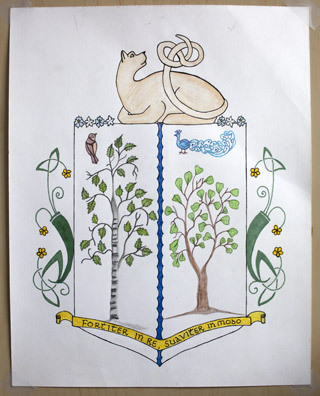 The only thing I think I should mention is this – the cat on the top is not there because I love cats. It’s there because I am very much like a cat – I am an extreme introvert, I like small spaces to hide in and I like to have control over my own life situations. 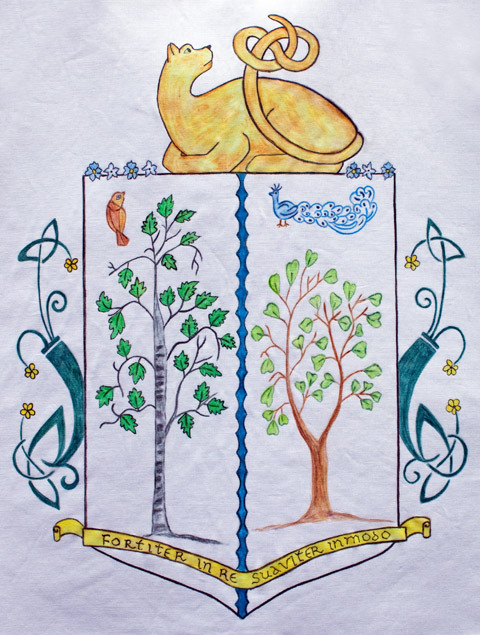 The last bit is probably best described in the Latin phrase you see on the shield – Resolutely in action, gently in manner – which is why I chose it. I am giving away these two patterns from my shop to celebrate spring – Spring Kites and Fair Isle Star. My giveaways are for my followers only and I would love for you to follow me anyway you like. 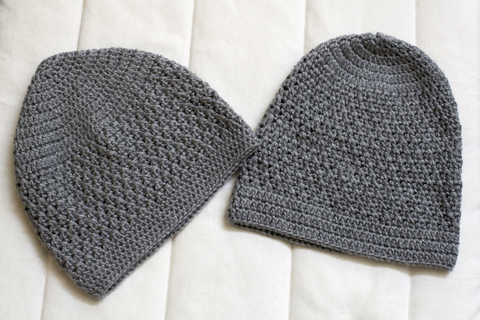 Please leave a comment and let me know how you follow my blog and you will be entered in my giveaway. The winner will be announced on Thursday, April 10th. 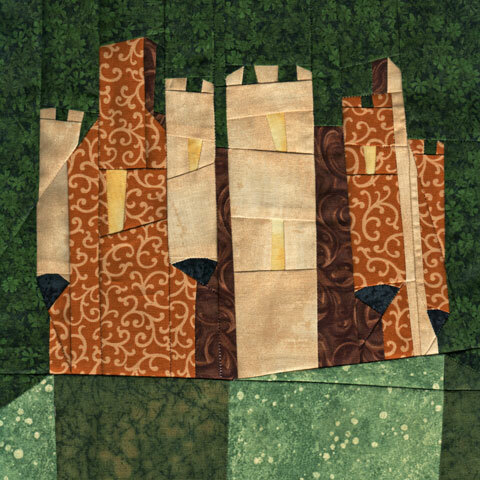 I was designing this castle quilt pattern while we were in the midst of the Spring Fling Blog Hop and then stitched the block last Thursday. It was a cloudy day here and the weather was unusually cool for this time of year. I had some stew simmering on the stove which would slow cook for close to three hours. The place was smelling very inviting and warm regardless of the cool, damp weather outside. 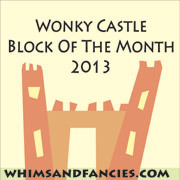 It was very easy to get in the mood that day to sew this castle. I wanted to make a sandstone castle. I didn’t like a single sky fabric that I had in my stash for this castle. So I figured why not build a castle at the edge of a forest on mossy ground. I imagine this castle is a bit haunted! 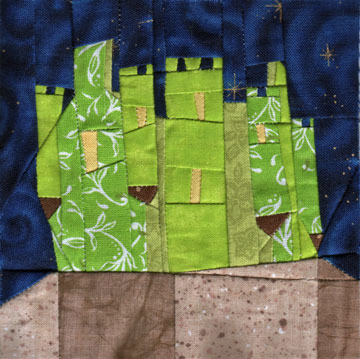 This 4″ x 4″ castle quilt block I made for my friends in the swap group this month is done in yellow-green. It was seriously challenging to make this one in a 4″ size. Some of the pieces are so tiny, no more than 3mm-4mm in size. I chain pieced the previous swap castles, despite not handling repeated activity very well. I felt like a conveyor belt, doing a job that merely needed to be finished in a factory. This time I went back to my previous methods of crafting one castle at a time. I thought of the old times of before conveyor belts when crafting anything was individual and special. Made me feel nostalgic and happy while the sewing machine hummed along! I haven’t painted a single picture for… oh, over a year now. While I love drawing with fabric in the form of paper piecing, I have been missing the actual motion of drawing and the scratching sound of pen on paper. 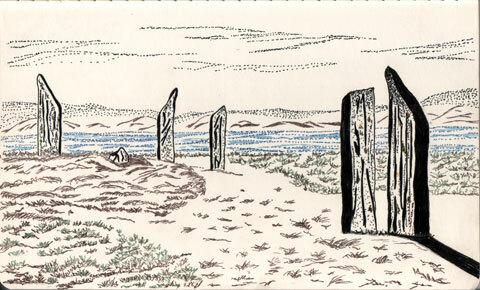 One evening I pulled out my notepad and micron pens and made this small sketch of the Ring of Brodgar in Orkney, Scotland. This was the first time I drew with micron pens. It was a bit challenging in the sense that micron pens come in very limited colors. I used another kind of pen to add a little bit of light blue for the water. I thought this post would be very fitting to show this drawing, since we are talking about castles. Of course, while she was here I didn’t get any sewing done, but I did get a sketch finished that I started working on earlier in the year. I am a decent watercolor painter, but when it comes to pencils and markers, my skills don’t reach very far. 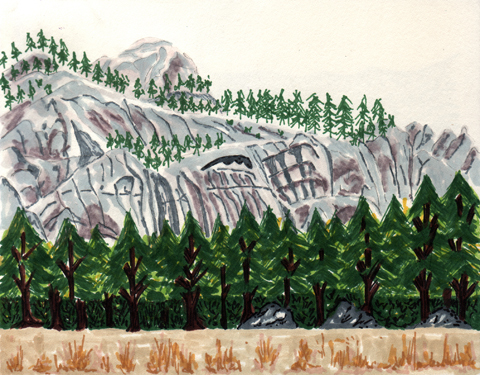 This one I started in the Yosemite Valley in January. I have never done sketch at location before. We were at the valley for my birthday and I got sick. So instead of our usual hiking around, we took it easy and drove into the valley during one afternoon with tea and some snacks. While Kaushik read, I decided to do a sketch from the parked car at Cook’s Meadow. I finally got around to finishing it, now that I have the right shade of gray that I didn’t have then.